Take your sound new heights with the high-speed, high-resolution, low-latency, and ultra-portable UAC-2 USB 3.0 Superspeed Audio converter. The bus-powered UAC-2 adds two channels of 24-bit/192kHz high-resolution audio to any USB 2.0 or 3.0-equipped Windows or Mac computer -- even to your iPad (Optional power adapter and Apple Camera Connection kit or Lightning to USB Camera Adapter required). It utilizes USB 3.0 SuperSpeed technology for low latency and includes advanced features such as 4x upsampling, Loopback, and MIDI I/O. Plug in any microphone, line-level device, or instrument and use the UAC-2 for onstage playback, recording to a DAW, or enjoyment of high-res audio in your home or office. You can also use it for fast low-latency webcasting, podcasting, gaming, and other live streaming applications. Think your headphones and speakers already sound pretty great? Try plugging them into the UAC-2 instead of your computer's audio outputs and treat yourself to the true experience. Now you can enjoy the ultimate in streamed high-resolution audio--all the way up to 24-bit/192kHz--in full fidelity. 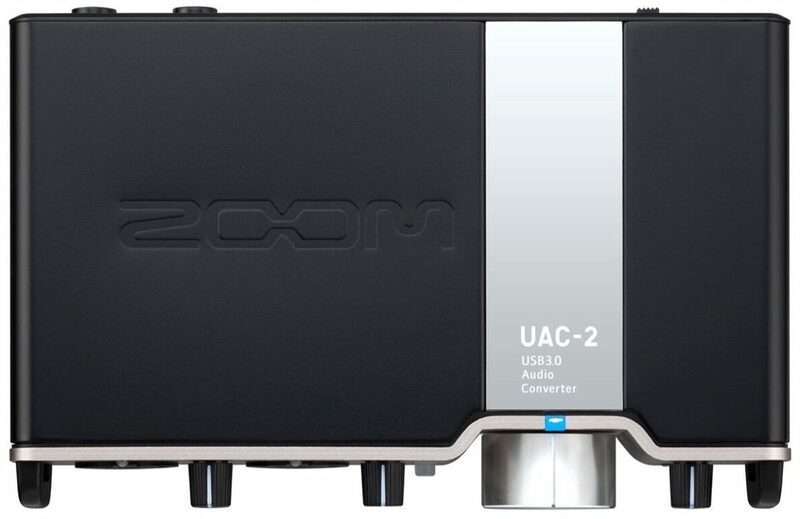 The UAC-2 is an incredibly versatile interface. It works with everything from legacy USB 2.0 laptops and desktops all the way up to the latest-generation Mac or Windows USB 3.0-equipped computers. Or plug in an AC adapter and Apple Camera Connection kit or Lightning to USB Camera Adapter (sold separately) and use it with your iPad. The USB 3.0 SuperSpeed transfer protocol supported by the UAC-2 is ten times faster than USB 2.0 and six times faster than FireWire 800. The result? Low-latency (2.2ms roundtrip @ 96kHz / 32 samples) for improved performance from your DAW software, and a stable data stream that is unaffected by computer jitter (slight variations in timing), so there's no need to connect an external master clock source. What's more, the extra bus voltage carried by USB 3.0 (900 mA, as opposed to the 500 mA carried by USB 2.0) allows for the use of higher-end electronic components such as the advanced preamps and converters in the UAC-2. Overall: The fine print at Zoom said the UAC-2's performance is not guaranteed for AMD CPU's and non-Intel USB chipsets are not supported. I asked Zoom support in New York if they plan to ever support AMD, he responded by saying my wish will be forwarded to the Developers in Japan for consideration. Used the Zoom for a week on AMD A10 system with Windows 10. Never lost the USB 3 Superspeed link, and the driver never popped or malfunctioned in any way. It has been working flawlessly the whole time. It's real simple to use but need to do a crash study on how to operate it correctly to achieve optimum performance. I've tried out the Mic, streaming audio, MIDI, guitar, various virtual instruments. It works very well with Omnisphere and IK's Amplitube. A little slow with 32 bit applications. It has several live action clip lights that are useful adjusting the gain. I'm using CBI TS cables no problems, but they are very hard to plug in and remove. The Zoom is an excellent upgrade, just what's needed, I'm very happy with it on an AMD system. Overall: This interface is very fast for a USB interface I got about 3.8ms round trip latency at 44.1khz 32 samples. The conversion is good not great but for the price it beat everything under $500. The preamps are ok but honestly if your doing hip hop or urban music this interface is good enough.